Impulse performs Tuesday, Aug. 7, at the 2001 Division II DCI World Championship Prelims. 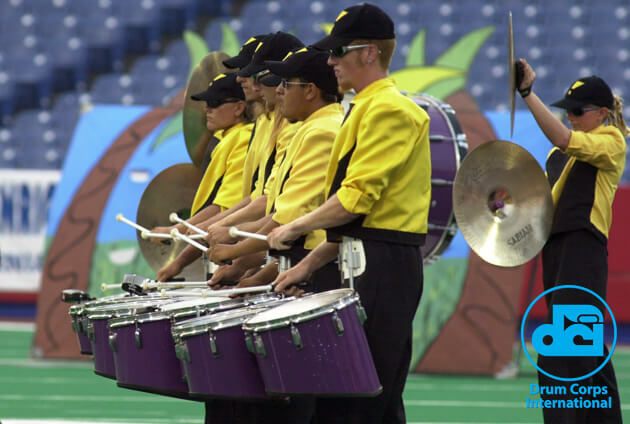 Founded just two years prior in 1999, the Buena Park, Calif. corps traveled across the country to Buffalo, N.Y. to attend its very first Championship in 2001. A look the corps still uses today, Impulse members turned heads in Buffalo, taking the field at Ralph Wilson Stadium in their unmistakable baseball caps and short-sleeved yellow uniform tops adorned with the corps' exclamation point logo. The group's 2001 production "Island Extravaganza," brought audiences on a fun trip to the Hawaiian Islands, complete with beach and volcano backdrops on the field and front ensemble percussionists clad in Don Ho-inspired Aloha shirts.